The other day Vickie Lester of Beguiling Hollywood posted a piece on Ruth Gordon, and it reminded me of one of my weirder non-family memories. I’ll sketch it out for you. A weekday evening in Chicago in the late 70s or perhaps 1980. The interior of an upscale Indian restaurant. The dining room glows with gold and rose tones, and the tables are small and intimate, for couples, covered in rose tablecloths and candlelight. Rather than elaborate Hindu decor, the design is elegant and classic European with small touches of Indian art for flavor. Outside it rains, but inside all is dry and quiet and warm. The faint fragrance of well-blended turmeric and cardamon, as well as melting wax, beckons new guests. 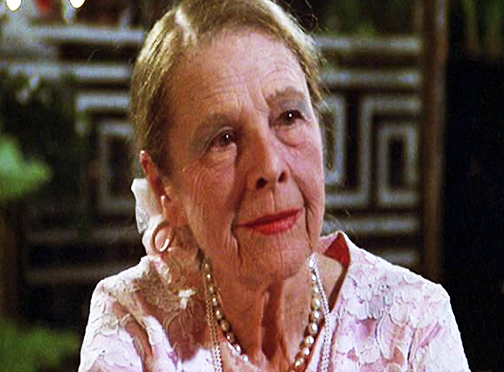 Ruth Gordon (1896-1985)–Famous movie star of Rosemary’s Baby, Harold and Maude, and Every Which Way But Loose. In addition to being an actor, Gordon is a writer–of screenplays, plays, and books. In this scene she is elderly, but still has her trademark brown hair (pulled back) and wry expression. Studs Terkel (1912-2008)–Writer Terkel is seated across from Gordon at one of the small covered tables. 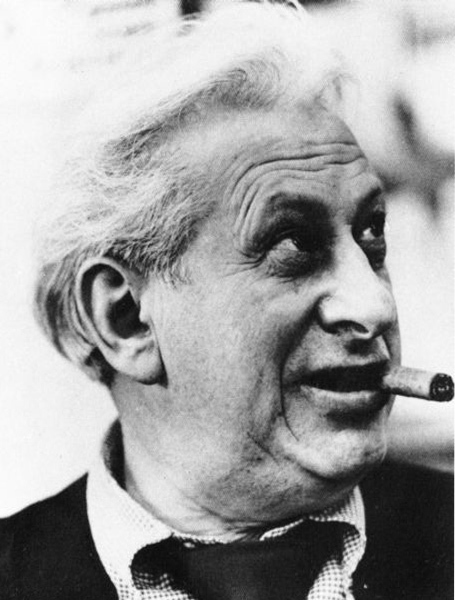 Terkel is also a historian and actor, as well as a radio personality. He and Gordon are good friends. They have much in common, both being actors and writers. Terkel’s hair is white and thinning, but brushed back from his forehead in a casual, confident manner. He’s got a sturdy overweight build that is more accepted in 1980s culture in a man than it would be in a woman. Young husband–In his 20s, this man has curly off-black hair and hazel eyes. He holds dreams of succeeding in business. He has an observant eye and a lot of knowledge for someone so young. Loves history and travel. He’s a rock. Young wife–In her 20s, this woman still thinks of herself as a girl. She married young and created and runs a retail business with husband. She enjoys it, but likes to read and write and has other dreams for herself. But right now she’s very naive and doesn’t know too much about anything. She’s not very observant. With her long brown hair and slim build, she’s considered pretty by many people, but she’s not a bombshell by any means. The young couple is seated at a small table. The lovely glow in the room relaxes them as they study the elaborate menus. They spent the day at the Merchandise Mart and Apparel Center, buying handbags and jewelry for their store. As the wife begins to sip her first drink, the husband leans toward her and whispers, “That’s Studs Terkel and Ruth Gordon.” He nods toward the table behind him. His back is to the back of the woman at the next table. A white-haired man with a compelling face faces the young wife across both tables. The wife says it can’t be. She barely knows that Studs Terkel is a writer and confuses him with Ring Lardner. She knows who Ruth Gordon is, but she can’t see the woman’s face the way the older woman is seated. The wife wonders aloud how her husband knows who the others are when his back is to them. This is one of the first times she learns a lesson she must repeat over and over again for over 30 years: that her husband has an uncanny way of knowing things. She peeks around her husband’s shoulder to sneak a glance at the famous man. She can see from the man’s expression and way of hunching at the table that he’s very sure of himself and comfortable with who is–and that he is “somebody.” Gordon is tiny and talks quietly to Terkel. In fact, she talks more than he does. A lot more. Perhaps Terkel is bored with the conversation or with his life, but he must notice the young wife peeking at him, so he glances back. Boldly. In fact, it’s not a glance. It’s too long for that. Before too long it becomes a stare. She feels shiny tonight in her teal silk blouse and gold chain. Terkel’s stare confirms that she looks shiny. He doesn’t look away for quite a while, but she withdraws her glance immediately. Still, she can feel his eyes on her. At first she refuses to look at Terkel. The more he looks, the more she tries to keep from glancing. Eventually, his gaze overpowers her and she glances at him. It’s just a glance as the moment he catches her eyes with his, she retreats. Terkel continues to stare at the young wife, with only an occasional flickering look at Gordon. The wife and husband finish their first drink, order another, and place their dinner order. Rather than feeling like prey, the young woman is nervous, but flattered. She occasionally slips a glance at the man who is the same age as her grandmother (though she doesn’t know it at the time) and at Gordon’s back. She wonders how Gordon can stand having her friend stare mercilessly at a strange girl. She wonders what kind of friendship they have that would tolerate this behavior. She wonders what kind of man Terkel is. He’s got a sloppy, rather mobile, face with a large nose which melts across his cheeks. He looks intelligent, almost dangerously so. His eyes tip a bit, but are symmetrical. He exudes virility. Occasionally, the young husband says, “He’s staring at you.” She says, “No, not really.” The husband laughs. “He’s definitely staring at you.” The young couple has finished their second round of drinks, and a bottle of white wine now sits in a chiller on a stand at tableside. They will be paying off their credit card for months. Only once does Gordon turn back and openly look at the young wife. Terkel and Gordon began their meal before the young couple. After forty-five minutes of staring so intense it feels intimate, Terkel walks out of the restaurant with Gordon without a backward glance. The wife, on the other hand, remembers this evening for decades. She thinks that Terkel doesn’t know that she’s a smart student or that she wants to be a writer or that she will become a feminist and go to grad school. He sees her as just another pretty girl. Oddly, she thinks she likes this strange experience. This objectification. People watching. Authors see a book in every encounter. I need to go read anything he wrote after that point and see if I’m in it ;). 😉 You probably are! (With name changed to protect the innocent). I think the old codger should have bought the sparkling couple’s dinner 😉 ! Now that’s an idea that would have been welcomed! Thanks so much for your kind words, Caitlin! This was a case where I wanted to frontload the information about the people because it’s not really a story without knowing who they are, so that’s why I used the sketch idea as a way to format. Ha – just this once indeed! 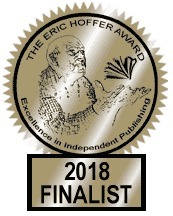 Barbara, thank you so much for reading and letting me know you liked it! I hope your week is splendidly wonderful! That is soooo interesting, and I love it told in third person. Haha, I am wondering about that “soooo.” I don’t usually do the 3rd person thing, but it made sense for this, I think. I’m glad you mentioned it. Luanne, I think the story doesn’t have to have a series of famous people, to make it an interesting piece of your memoir! This one particular night with the special event of seeing Studs and Ruth… that was more than enough, especially all the details that you wrote so intricately. It revealed you and also, your relationship with your husband, from the very beginning…Well done! Oh, I love hearing that. Because, yes, memoir should reveal much more about me than about other people. Thanks, Robin! I love this, Luanne! When a woman feels ‘shiny’ you know she’s feeling good! 🙂 Great story! Thanks, Jill! I’m so glad you understood that feeling I was trying to convey! Thanks so much, too, for your loyalty. It means a lot! Great story! I agree that this belongs in your memoir. Daniel, thanks so much for your kind comment and for reading the post! Re the memoir: hah, not sure it would fit with the story I’m focused on, but maybe I needed to write a different memoir! What caught my attention was the camaraderie of the husband and wife. They are enjoying a drink before they even order, the husband is totally unthreatened – maybe even a tad proud – of the stranger’s admiration for his wife, and the wife’s so comfortable she shares the moment with her husband. I bet these are the type of people who, 30 years later, call out to each other from different rooms of the house just to know where the other half of their team is – lovely! That was a lot of fun, and I can see why S.T. stared. “Shiny” is the right word…or even “fiery.” You have a beautiful intensity that draws the gaze. Aw, shucks. You’re a sweetie. (I had to restrain myself from batting that compliment right back with a sharp crunch. I’m working on accepting nice comments). Thank you so MUCH for pointing out that little fact here. Yes, if Terkel had been some unknown creepy pervert I might have been tempted to empty the remains of that first drink on his lap. Haha, I read that, too, about how he got his name. But that being his name resonated so perfectly for my story ;). Whoa, Luanne- “loved” this short story! I could feel his eyes staring at you; it was a bold, intimate and beautiful act. Brilliant ending! Great story! I thoroughly enjoyed it! What a wonderful story, although I probably would have wanted to trade places with my husband just so I could be closer and eavesdrop 🙂 But that probably would have been a bit obvious. Perhaps Terkel saw your future in you and that’s why he kept staring. Thank you for sharing this memory, Luanne. I was reading Terkel’s 2008 memoir “Touch and Go” recently, and he made a brief description of someone as “…a Ruth Gordon type.” I wondered if the two had ever met or worked together. Just found this in pending comments. Thank you for mentioning this about a “Ruth Gordon type.” How fascinating!